Temperature : Max. 37.1° C and Min 36.4° C in Summer. Max. 21.3° C and Min 20.1° C in Winter. Chidambaram is famous for the temple dedicated to Lord Nataraja, the Cosmic Dancer (Lord Shiva). 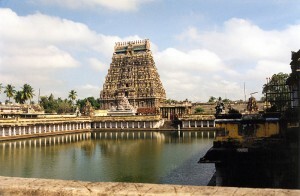 Tall and towering temple marks the landscape of Tamil Nadu. They remain as preserves of cultural heritage and protectors and promoters of inner urge of people for ethereal bliss and blessings of the Almighty. Chidambaram is one such scared place with Lord Nataraja Temple. This temple is built during the 11th century. The Nataraja image in its various forms really holds the devotee as well as the tourist in ecstasy. Air: Nearest airport is Tiruchirappalli at a distance of 168 km. Rail: It is connected by rail with Tiruchirappalli, Madurai and Chennai. Road: It is well connected with all major towns. Kali Temple: The Thillai Kaliamman Temple is on the northern end of the town. It was built in between 1229 A.D. and 1278 A.D.
Annamalai University: It is a residential university, which is situated on the eastern outskirts of the town and is a great centre of Tamil learning and Canadic music. It knows offers educational facilities in various disciplines including Medicine, Engineering etc. Navagraha Temple (Shrine for Nine Planet): Nine planets have temples in nine scared centers. Prayers to planet temple are supposed to ward off bad luck and ensure piece and prosperity. Thirunageswaram: One of the temples for nine planets is here. Thirunageswaram derives its name from the legend that the serpent Adi Shesha worshipped Lord Shiva here and the locality is identified with Chaurpakaranya. Suriyanarkoil-Sun Temple: This is the only temple where the Sun is worship with the image of the Sun God. Alangudi: The temple for Guru (Jupiter-planet of prosperity) is visited by pilgrim seeking blessing and prosperity. Tirunallar: The temple for Saneeswaran (Saturn), is located near Karaikal at Tirunallar-Prayers, it is believed, absolve one of his or her sine and brings in good future. Thiruvenvadu: One of the Navagraha Temples for Budhan (Mercury) is situated here. It attracts good number of devotees. Keelaperumrallam: Another Navagraha Temple for Kedhu is here. Lord Shiva is worshipped as Naganathaswamy. Kanjanur: Nearer to Suriyanar Koil, Kanjanur has a shrine for Sukkiran (Venus). The presiding deity Lord Shiva here is worshipped as Agneeshwar. Nagore Dargha: Similar to Velankanni in its popular appeal is the dargha of Hazrat Meera Sultan Syed Shahabdul Hameed. Just 4 km to the north of Nagapattinam, the tomb is almost 500-years old and is capped by a golden dome and flanked by a five minarets. The tank is called Peer Kulam and is believed to have curative powers. People of all faiths visit the dargha. Pichavaram: Pichavaram is situated 16 km from Chidambaram. Pichavaram ranks among the most exquisite scenic spot with abundant and varied tourism resources. The backwaters, which are interconnected by the Vellar and Coleroon system, offer abundant scope for water sports rowing, Kayak and Canoeing. Sirkazhi: Sirkazhi is situated 20 km from Chidambaram. This town is renowned in Tamil Literature as the birth place of Thirugnana Sambandar, the Tamil Saint. Saivite Temple is dedicated to him, and the shrine looks like a child god. A large crowd gathers in Sirkazhi to witness the Tirumulaippal festival celebrated in April. To visit this place bus and trains services are available. Vaitheeswaran Koil: Vaitheeswaran Koil is situated 24 km from Chidambaram and 6 km from south of Sirkazhi. It has a large and important Shiva Temple. Vadalur: Vadalur is situated 37 km from Chidambaram. The Santum of this Sabha or temple is separated from the main hall by seven screens, of which only three are removed on ordinary days. It is on the ‘Thai Poosam’ dayin December-January all the seven screens are removed so that the devotees can have a darshan of the ‘Jyothi’, the Eternal Flame. Gangaikonda Cholapuram: Gangaikonda Cholapuram is situated 48 km from Chidambaram. Gangaikonda Cholapuram and the palace have been built between 1023 and 1029 A.D. and around Gangaikonda Cholapuram one can visit places of interest and tourists attractions and landmarks of religion and new surge of creativity of the 10th and 11th century. Maligai Medu: Adjourning Gangaikonda Cholapuram is a place called Maligai Medu. Archeological findings reveal the glory of Rajendra Chola I. The state archeological department is seized of the historical importance of the place. The Cholagangam Lake: The Lake is now called Ponneri. The bund is very high and the length been more than 5 km, at full water level, it has a water spread of nearly 130 sq. km. Jayankondam: Jayankondam is 10 km from Gangaikonda Cholapuram. The nearest railway station is Sendurai or Ariyalur. The roiginal name of this place was Nellimanagaram as the sacred tree in the local Shiva Temple is country gooseberry tree. Mailam: Mailam is situated 85 km from Chidambaram. There is a Murugan Temple on a hillock. The Panguni Uthiram festival held in March-April attracts devotees in large numbers from far and near. Gingee: Gingee is situated 132 km from Chidambaram. This spot is well known for historical place, blending history and architecture. There are is 700-year fort standing on three hills, steep, rocky and covered with enormous boulders that they are inaccessible. It is a picnic spot and a historical place for the study of early history of South India. Tourist and students visit this place. Frequent bus service is available. Kalrayan Hill: Kalrayan Hill is situated 150 km from Chidambaram. Spread over an area of 600 sq. km these hills offer a temperate climate and quite solitude. There is a botanical garden on the hills. There are two waterfalls here. The area is ideal for trekking. This entry was posted in Chidambaram, Tamil Nadu. Bookmark the permalink.